C. On DC1, Install OomADs.msi. D. On Server1, install MOMADAdmin.exe. Your company has a private cloud that contains a Microsoft ASP.NET application. The application is hosted by Internet Information Services (IIS) on a server named Server1. The application is accessed by using multiple URLs. You configure a watcher node on a server named Server2. 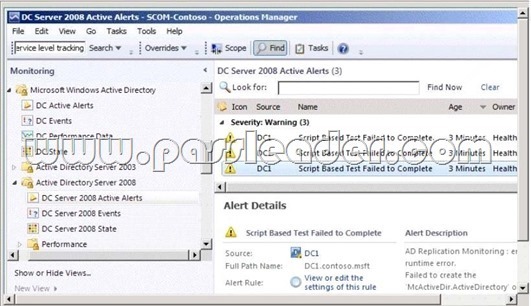 You need to ensure that an alert is generated each time the watcher node receives an HTTP error of 400 or more. The solution must ensure that the cause of the alert is captured. Which type of monitor should you create from the Operations Manager console? Your company has a private cloud that is managed by using a System Center 2012 Operations Manager infrastructure. The network contains three devices. The devices are configured as shown in the following table. Each SNMPv3 device would need its own run as account. As there are no SNMPv3 devices in the list only v1/v2 we need just one run as account per different community string. As there are two diffrent community strings used for the 3 devices we need two run as accounts. Your company has a private cloud that is managed by using a System Center 2012 Operations Manager infrastructure. The private cloud has a connection to a partner company. The connection uses a router named Router1. Router1 is owned by the partner company. The partner company’s security policy states that only partner company network administrators can access the configuration information of the partner company’s network devices. You need to monitor the availability of Router1. The solution must meet the security policy requirement. Which access mode should you configure to discover Router1? It says we must not access the configuration information of the partner company’s network devices. So SNMP is not a choice, because it will give us just that. To monitor the availability, in other words the online/offline status of the device, we may use ICMP. Of course the device must answer to our ICMP requests like “ping”, but that is not part of the question. Your company has a private cloud that contains a System Center 2012 Service Manager infrastructure. You create an incident template as shown in the exhibit. (Click the Exhibit button.) You need to add SMS as an available source in the incident template. What should you configure? To answer, select the appropriate configuration in the answer area. Your company has a private cloud that is managed by using a System Center 2012 infrastructure. You plan to deploy a single-tier service to the private cloud. The service is configured to use Network Load Balancing (NLB). 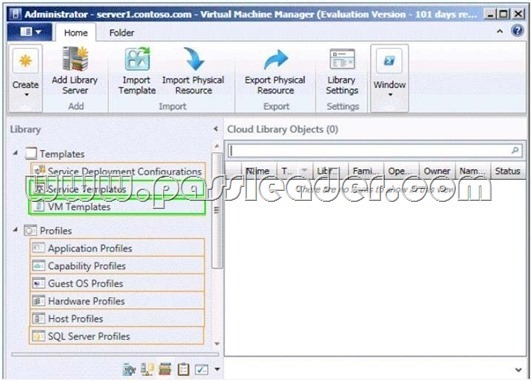 You need to create a Hardware Profile for the virtual machines that will be added to the service template. The solution must ensure that the virtual machines will use Windows Network Load Balancing. Which settings should you configure in the Hardware Profile? 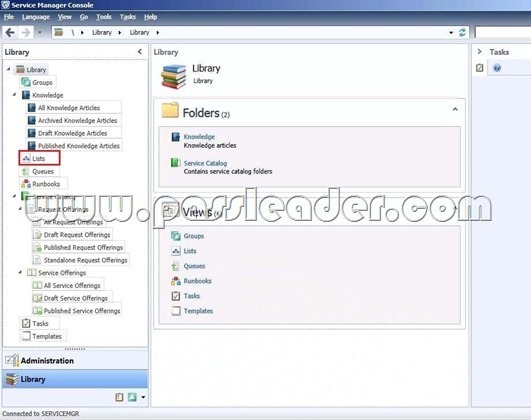 To answer, configure the four appropriate settings in the dialog box in the answer area. Your company has a private cloud that is managed by using a System Center 2012 Virtual Machine Manager (VMM) infrastructure. The company has multiple departments. You need to deploy a two- tier web application to the departments. Which two library objects should you create? To answer, select the appropriate library objects in the answer area. The key to the question is deploying many versions of the same two-tier application. A Service Template is required for this. Additionally you need a VM template to create a service template. Your company has a private cloud that is managed by using a System Center 2012 infrastructure. The network contains a Service Manager infrastructure. The company implements a service level agreement (SLA) for the private cloud. You need to recommend an escalation notification solution for when an SLA warning threshold is exceeded. What should you include in the recommendation? You can use the following procedure to create a workflow rule that will change the support tier to Tier 2 whenever the Urgency property of an incident that is related to printing problems is changed to High. This procedure assumes that you already created an incident template to change the support tier to Tier 2, and it assumes that you already created the priority calculation table. For more information, see How to Set Incident Priority and “To create a new printer-related incident template” in How to Create Incident Templates. You have a System Center 2012 Operations Manager infrastructure. You have a line-of-business web application named Appl. App1 stores its information in a dedicated Microsoft SQL Server database. Your company defines a service level agreement (SLA) for App1 of at least 98 percent uptime. You need to iMP1ement a solution that measures the availability of Appl. You create a distributed application for Appl. What should you create next? Your company has a private cloud that contains a System Center 2012 Service Manager instance. Service Manager has the Self-Service Portal installed. You create a service offering that contains a single request offering. The service offering provides logged-on users with the ability to add their user account automatically to a group named Group1. You need to ensure that all requests for group membership changes require approval from the security department. What should you modify? B. From the Service Manager Shell, run the Update-SCSMWorkflow cmdlet. C. From the Service Manager Console, create an Orchestrator connector. D. From the Orchestrator Deployment Manager, register the Integration Pack for System Center Service Manager. E. From the Service Manager Console, update the Problem Status list. F. From the System Center 2012 Orchestrator Runbook designer, create a connection.